I’m just getting back from a business trip to Dallas where I had the privilege of teaching the marketing component of the Certified Church Consultants program that the National Association of Church Design Builders hosts. I arrived home on Wednesday evening but then had to leave for Cleveland, Ohio on Thursday morning. Going out of town is difficult sometimes, but back-to-back trips are a challenge. We’ve all been there (whether for vacation or business), you know you have to get ready to go on the trip and as the date arrives, you start to think of all the things you’ll need to pack. I’m a procrastinator when it comes to actually filling the suitcase. Usually just a couple of hours before I leave, I go through my closet and decide what would be the most appropriate things to take. This usually means that I throw a few extra items in that will coordinate with each other. And I end up over-packing. Well, you’re getting ready to take yourself and your congregation to a destination. That’s your vision. And when it comes to packing your suitcase, you need to take the necessities. You have to take your “dreamlining” list and anything that is required to reach your dreams. Keep your audience in mind and consider what your church will look like once you’ve achieved your vision. Imagine all your benefits. Be sure to pack your top 3 as we discussed in the Chapter. Your filled suitcase is your “brand”. It’s every thing you need to promote your church. But to make it simpler, we attach your brand to some visual items. We live in a visual society, and “the visual” is easier to remember. The right visual brand, will attract the audience you desire. A Simple, yet Dynamic Logo. The definition of simple? An elementary school child should be able to draw your logo from memory. If they can’t, it’s too complex. Just look quickly at the top 5 companies of the Fortune 500 companies and you’ll see that their logos are pure simplicity. Be sure to do the same! A Color Suit. 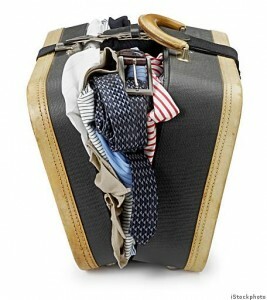 Like packing for a trip, it’s more effective if you have everything that coordinates in color. Imagine a men’s suit: The actual suit (the largest amount of color), the shirt (the medium amount of color) and the tie (the small amount of unexpected color). Once you decide on your Primary, Secondary and Tertiary color suit, use those colors every where (in the amounts you’ve chosen). Use your tertiary color only randomly; it adds some personality to the mix. Catchy, Simple Slogan. We call that your brand positioning. It’s a short (5 words or so) message that communicates (or can be assigned to) your key benefit. It needs to be memorable and evoke an emotional cord with your audience. There are also two audiences for your Church to consider: internal (your current membership) and the external (your community, not yet committed to a local church). Website: Simple, interactive, engaging, professional. With content that reflects your benefits in some way; or leave it out if it’s off point! Remember that the average person spends 10 seconds or less on a page and will rarely ever click more than 3 times in your site. Worship Guides: A lot of churches are getting creative with these. Keep them simple and point people to your website for the details. E-Blasts: Gather emails from your congregation and save time and money communicating to them in a branded professional way. Be consistent with message, content, design and timing! Be regular without filling their email box. Website: The same as above, just make sure that their’s enough content to woo a person from your community to your Church. Statistics say that they’re interested in your doctrine (what you believe), where you’re located (and how to get there) and who’s the Pastor. Direct Mail: Target a certain geographic area, buy a mailing list (or hand deliver) — then produce a useful direct mail piece. Put yourself in the community’s shoes and give them enough information to entice them to your location or website. Be professional, and promote your positioning. Only! Service Projects: The Church without doors. Get out into the community and serve. Be sure that everyone has the “message” about your Church ready to be given — either in word or printed. So there you have it! It’s easier written than done though. That’s why our PinPoint team works with Churches. We love to help walk you through the process and provide the materials you need. We’d love to help you achieve all of this. Contact us today to get started with a free consultation! We help you Communicate. In Unison!